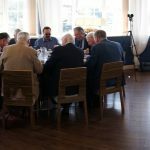 Recording of Lord Leslie Griffiths at Stradey Park Hotel giving his View from the Front Bench on Thursday 19th April 2018 Lord Griffiths Speech @ Stradey Park Hotel from Llanelli Online on Vimeo. The dinner was held at the Stradey Park Hotel. Here are some photos from the evening.